This is probably my favorite image in my collection. It is of the Wilson Avenue Theatre, now a TCF Bank, on Wilson near the northeast corner of Broadway. (You can see a bit of the Uptown/Wilson El Stop in the lower left corner). 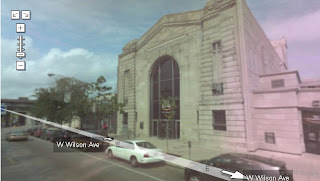 The image below, captured from Google maps, shows the same stretch of Wilson. The theatre/bank is the only building left. I have heard rumours--unconfirmed--that an entertainment company wants to buy the bank and renovate it as a small theatre space. Can anyone confirm this? That used to be quite a grand corner. We wonder what residents from 80 years ago would think if they saw this same intersection today? Interesting bit about the theatre. Thanks for these fabulous images. It makes me quite melancholy to see what a vibrant and built-up area Uptown was back when . . . There also used to be a theater on Wilson where Truman College now stands. I would love to see what that block (south side) looked like before the college was built. You can ask your alderman. Helen Shiller made an activist name for herself by opposing the building of Truman. Too yuppie and too disruptive to Uptown's squalor for her tastes, dontchaknow. Green Fairy, your blog rocks! Instead of mourning the way it was, it makes me want to build Uptown back up to the status it had in the early 1900s. This used to be the Bank of Chicago, where I opened my first bank account with $5 back in July 1965. Does anyone know what the Lizalzi Theater Co. was ? 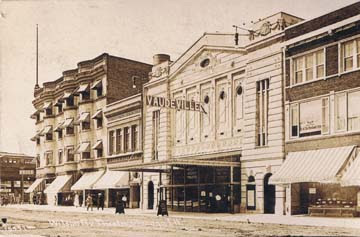 It is in a reference to the Wilson Av Theater in 1915. I put "Lizalzi" into the Trib Archives search and go no hits. Is spelling correct?